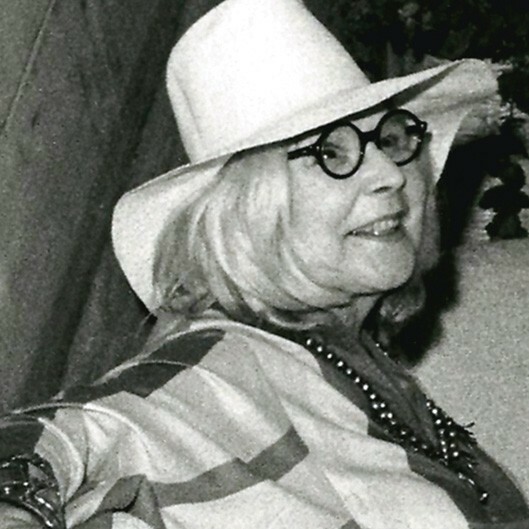 Maggie Dreyer at my 30th birthday party, Chaucers, Plaza Hotel, Houston, Texas, August 1, 1975, a little more than a year before she lost her long battle with cancer. 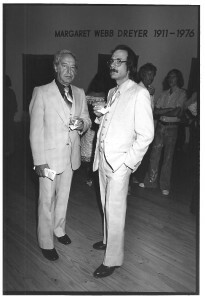 Photo by Janice Rubin. 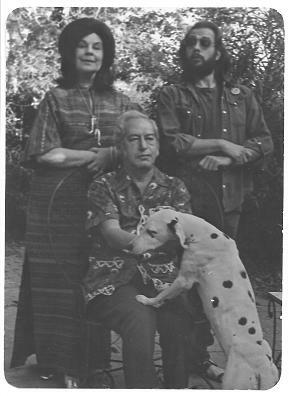 Back in the 1970s, when I was working with KPFT, the Pacifica radio station in Houston, I interviewed my mother one Mother’s Day. I still have a cassette from that show but it is sadly silent. I have decided to tell Maggie’s story here through the words of others — and a few vintage ones of my own. For those of you who didn’t have the very special pleasure of knowing her, I would like to introduce you to Margaret Webb Dreyer. The artist as a young woman: Margaret Webb Dreyer, 1945. 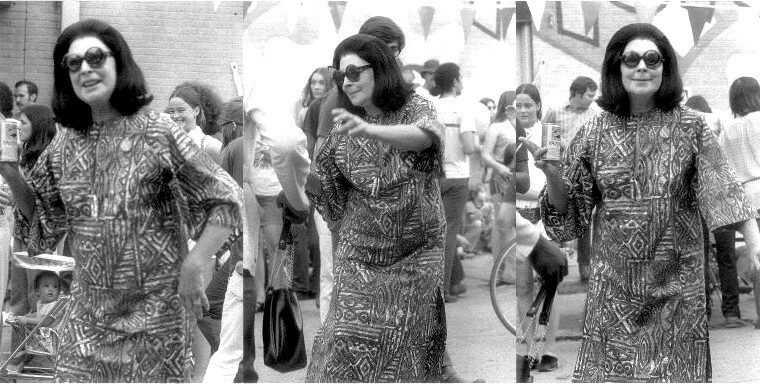 Maggie dances at Anderson Fair’s Montrose Block Party in Houston. Photos by Judy Weiser. 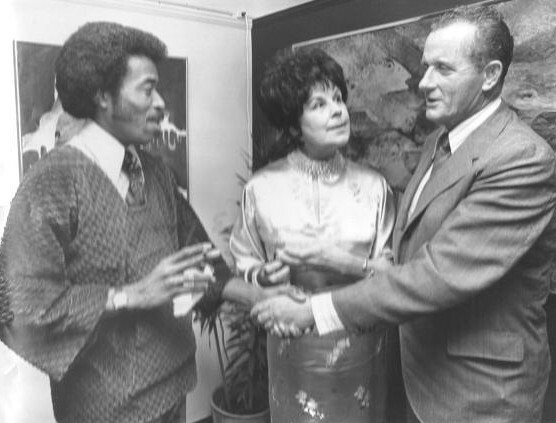 Maggie drew diverse people together: to her left is artist Burford Evans, whose work she exhibited, shaking hands with Leroy Gloger, owner of country station KIKK and a Houston Rodeo vice president. Photo by Blair Pittman / Houston Chronicle. thing to be proud of! Photo by Victoria Smith. 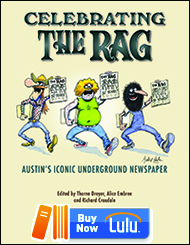 This entry was posted in RagBlog and tagged American Artists, Dreyer Galleries, Great Texas Women, Houston, Houston History, Influential Houstonians, KKK, Margaret Webb Dreyer, Martin Dreyer, Mother's Day, Peace Activists, Rag Bloggers, Remembrance, Rothko Chapel, Thorne Dreyer. Bookmark the permalink. 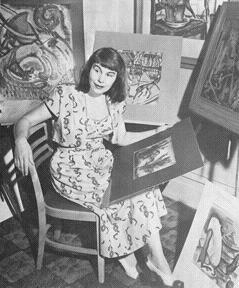 Margaret Dreyer was a gallery owner and an artist. She invited me to show my paintings in her gallery and some of them were sold there. She was very kind to me. Margaret introduced me to my wife, Marion. We have been married 52 years. Wonderful tribute. I was lucky enough to “work” for Maggie at her gallery ’68-69ish. I was the greeter at the gallery which basically meant I kept her company while she regaled me with her stories. I also spent a lot of time washing her dishes and picking up after her little dog but she fed me, entertained me, counseled me and utmost always encouraged me. She let me be an artist. She actually got me my first mural painting jobs. One at a head shop and one at a bar but hey, I was painting. I loved her and I think she loved me too. People like that come into your life for a reason. Thanks Thorne. Thank you for this lovely tribute to your mom, Thorne. My partner and I were just in Houston this weekend for the Art Car Parade and we certainly could see and feel the creative vibe that exists in Houston. It is wonderful to learn more about the role your family has played in that, and how the arts and the defense of human rights are so entwined. i remember margaret… and the gallery… and the times then. being one of houston’s small group of anti-vietnam war actiists then, i was more than once in the gallery for meetings and events. i remember the kkk throwing red paint over margaret’s car and the front of the gallery one nite, if i’m not mistaken. it always felt reassuring to have margaret and martin and some of the other “big” personalities in our midst as our scraggly group tried to work for peace in the inhospitable and downright dangerous atmosphere in houston in those years. i remember being involved all together with The Underground Railroad head shop and alternative meeting place in old market square downtown also. those were great times, good people, heart-warming memories. thanks for posting these stories about your mom. I was lucky enough to meet your mother at your parents’ gallery / home. She was warm, vivacious, and threw a great party. Even shy, goofy, tongue-tied little girls such as myself were made to feel at home. It was the first time I’d ever eaten caviar, so exotic! I remember – with sadness – trooping to MD Anderson with others to donate plasma for her during her illness. The apple didn’t fall far from the tree, Thorne. Maggie Dreyer is a wonderful, mystical, and inspiring spirit. I say “is” because I still feel her presence in my life. There are few enough who give us true encouragement and a sense of unlimited hope but Maggie gave it in spades. She called forth the better and brighter angels of our spirit and she still does for those fortunate enough to have known her and shared her light. I always wanted to reach a little higher and be a little better because of her. The Fred Hofheinz statement is something we should all wish we could do. You were blessed to have a mom like that Thorne. She sounds like someone I would have love to have spent time with. You Houstonites are lucky to have known her. Margaret Dreyer’s unique political aesthetics showed that there’s no difference between art for art’s sake and art for “the people’s” sake. To describe Martin and Maggie Dreyer as unique would be a massive understatement. The way they bridged the art and activist worlds was in itself a work of art. They were gracious and kind,well spoken and outspoken. They did a lot of good which I suppose is the greatest accolade you can hang on someones legacy. She was a wonderful and gorgeous woman, an inspiration to many, and I feel so fortunate that I had a chance to meet her, if only very briefly — I think I must have “imprinted” her a bit, like a baby bird; I admired her strength and self-assurance greatly! Fine post, Thorne! I am a little slow in catching up on my Rag Blog reading — but glad to have seen this. It also helps me understand you more. Good going ! Very nice, Thorne … made me recall such wonderful things … your father whom I knew from the old Houston Press Club in the Rice Hotel, your mother of course from everywhere … Anderson Fair in Montrose, and La Carafe in downtown Houston’s Market Square. One day after a party I threw overflowing my small apartment, your mother called to say she thought she had lost a piece of jewelry during the revelry and could I please look around for it … a pre-colombian silver pendant in the form of a Thunderbird … I was so happy when I found it under a piece of furrniture … I immediately called her back took it to an address she gave me … her home I guess it was, somewhere in Third Ward, I seem to recall. I wish I had known you and your family when I was growing up. Houston was filled with so many money hungry people. Fortunately, my father taught me the values he learned from his Quaker mother. They have been very important in my life.We ought not to allow conservative hypocrites claim a monopoly on moral values. Thorne, I remember your magnificent mother Maggie with awe and respect. She was a queen in her gallery and the art opening I attended there was memorable. The upstairs living quarters was an extension of the gallery. ART was the reigning spirit of your home. I had never met a mother like yours and she was boldly living her life outside the norm and inside her own belief system. She was lovely and fearsome at the same time.